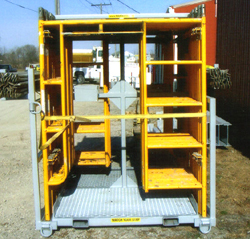 The MAXSRACK � scaffold system has four 3�x 6�x1/4� lift tubes so it can be safely attached to an industrial fork lift machine from all four sides. 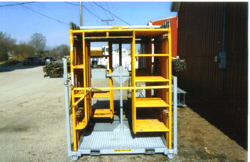 The MAXSRACK � scaffold system also includes 3/16� expanded metal floors on top of the lift lubes for secure footing to stand on during scaffold assembly as well as disassembly. The New MAXSRACK � Scaffold System holds cross braces and pins. The MAXSRACK � Model B has OSHA compliance features built in to create a safe working environment. 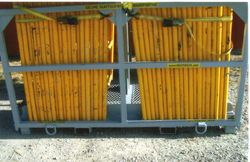 The MAXSRACK � Scaffold System is designed for field use. The platform is elevated 4 inches to keep rack out of the mud. The 4 inch channel is perforated to drain rainwater. The MAXSRACK � Scaffold System is craneable with the use of a spreader beam. 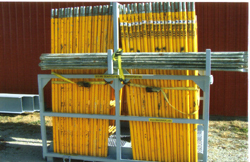 The MAXSRACK � Scaffold System will stop your scaffold damage. It centralizes your scaffold parts and makes inventory a snap. This new MAXSRACK � Scaffold System will take hours off your labor time and make you more efficient. Scaffold System Empty Weight � Only 1,100lbs. Loaded with 20sets of 6 foot scaffold and braces-3,800lbs. Save Over $1800 On Our Scaffold System While Supplies Last! SPRING SPECIALS - We Are Currently Offering A Special Pricing Opportunity. 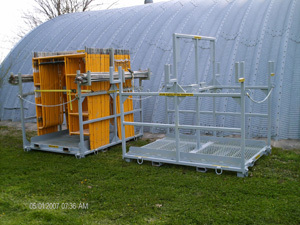 The Next 100 Scaffold System Units Sold Will Receive Special Spring Promotion Pricing Of Only $4750.00. Hurry! This Sale Won't Last Long! Affordable Leasing Option Now Available For Our Scaffold System! Watch Our Scaffold System Video!